So, recently our beloved podcast hosts took a week off. Although someone with the Twitter handle @ComfortablySmug said it was because they hate their fans, we all know that these guys love their fans. Well, we think we know that. The point is, everyone gets a week off, right? Even guys who work just ten minutes on a Tuesday and an hour on a Thursday. All this brings us to the question we have all been asking: just what exactly did they do with their week off? Thankfully you have a guy here willing to do some shoe-leather reporting. That’s right, I went out there and found out what they did with their precious week off which for us in the Substandard Expanded Universe (#SSEU) was positively the worst week in the past year and a half. Even worse than that Real Housewives episode when that one housewife said something catty about that other housewife. That was epic, and we all had to mourn the relational harmony that was lost. 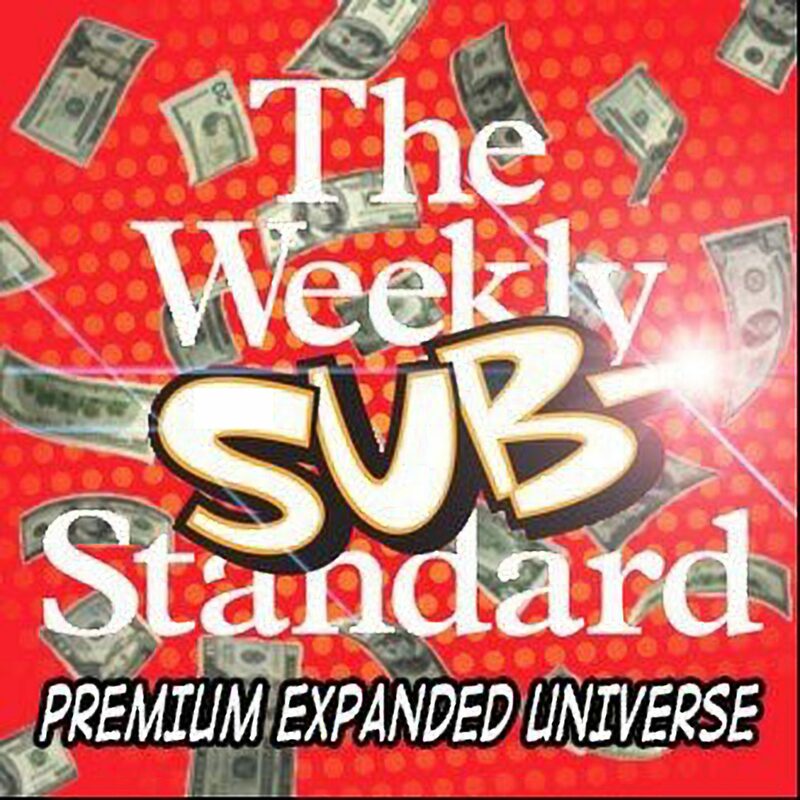 But the Substandard podcast is back, our national nightmare is over, so let’s move on to the episode without further ado. This scene opens in the Last bedroom. It’s 2:30 AM. That’s just an hour and a half before JVL’s alarm is going to go off. Because he gets up at 4:00 AM. To run. Like a perfectly normal person. At least he watches movies on his phone in portrait mode while he runs. That redeems him at least a little. Prior to having children both Jonathan and Shannon firmly agreed that children belong in their own bed in their own rooms. They agreed to this over mimosas at brunch one Saturday morning (yes, before children they were brunch people. See, having children can make you a better person). At this particular brunch, they looked at each other, and made their naïve views on child-rearing known to each other. They did this with brows furrowed as they nodded quite seriously at one another. It was adorable. They knew nothing about the sleepless nights they would endure, the bleary-eyed desperation that would set in, or that they would never not have bloodshot eyes again. At this lovely brunch they couldn’t envision a scenario where one of them would attempt to text the other only to accidentally tweet what was supposed to be a private communication. They had the unearned confidence in their opinions about child-rearing that only someone without children could have. They had not gone through the crucible of stress, lack of sleep, diaper changes – so many bleeping diapers, food throwing, walking on Legos with bare feet, and all the other painful realities of parenthood. So sweet. So optimistic. So dumb. Since this conversation over brunch real life intervened. Child #1 (I think we called him Pat) slept only in his crib/bed. Of course Favorite Daughter slept in her own bed. But by the time Child #3 (the infamous Not Favorite Daughter) came along the Lasts were running on fumes and many of the firm rules they had established went out the window. Double dipping in the ranch veggie dip prevailed. Kids slept wherever they would @#*%-ing sleep. A late afternoon caffeine boost became the norm. Jonathan occasionally grabbed himself a second “daddy juice” in the evenings. When the kids seemed bored the toy budget got ripped to shreds as JVL would go to the Lego store and MAKE. IT. RAIN. Back to the Last master bedroom. Baby stirs. Jonathan and Shannon don’t move a muscle. Baby sits up. JVL and Shannon are entirely unaware of his movements. Baby grabs the headboard and stands up. He begins to stomp his feet. No effect on JVL or Shannon. He starts to jump up and down chanting something to the effect of “I find yo wack ofayfe distoobing” No reaction from his parents. He looks at his parents and wonders what it is that is keeping them from giving him attention. Baby gets down on all fours and tries to look Mommy in the eyes. No reaction. He pivots to look Daddy in the eye, but just at that moment JVL subconsciously senses the coming of a sneeze and raises his hand to his nose to cover his sneeze (it’s so unhygienic to not cover one’s sneeze). But what’s that on his wrist? Its…his Omega Seaward watch! JVL catches poor Baby in the nose with the crown of his watch (crown…that’s a part of a watch, right?) drawing blood. Baby breaks down in tears waking both Jonathan and Shannon. JVL first looks at his watch. Is it to see what time it is or to gaze at its magnificence? We may never know, but I’ve got my money on the latter. When JVL looks at his watch he notices there is some red liquid on it. Not being of sound mind he tastes it. It’s salty. It’s…blood! It’s Baby’s blood. Never before had JVL developed a taste for mammal blood, but in this late night desperation he suddenly craves pounds and pounds of blood sausage. Where does one purchase such a disgusting German confection? There’s only one person he knows who is both a glutton and an unrepentant aficionado of all things German. JVL takes off his Omega watch and grabs his Poop watch – for athletes – from the bureau and dials up the one and only Victorino Matus. This scene opens in the Charles E. Smith Center. What, you may ask, is the Charles E. Smith Center? It is the site of George Washington University’s Women’s Gymnastics team’s home meets. Why would a Georgetown grad attend a GW gymnastics meet? Because Georgetown doesn’t have the good sense to field a team. And Vic’s done driving out to bleeping Towson to get himself some totally legal gymnastics viewing. And they’ve been cracking down on non-parents attending, um, junior competitions. So GW it is. Vic is sitting in the stands, munching on popcorn, and gazing through the lenses of his binoculars. Sonny and JVL walk up and take their seats next to him. Sonny gives Vic a gruff nod acknowledging his presence but communicating a clear disgust at being here. JVL goes in for his customary hug, but Vic looks at him with a look communicating that JVL definitely doesn’t want a hug from Vic right now. Vic: I’m so glad you guys are here! I got you guys season passes thinking this would be something we could do together, but this is your first meet. Sonny: I didn’t know it was gymnastics season. (Pauses) When is gymnastics season? Vic: It’s always gymnastics season when you’re a booster. Sonny: You’re a booster of GW athletics? Vic: What’s wrong with that? Sonny: You didn’t go to George Washington! You went to Georgetown! JVL gives them both a glare indicating that he’s not interesting in gentle ribbing about not getting into Georgetown. Vic: I can’t be a fan? Sonny: Wait, Vic, why are you wearing a trench coat? It’s not raining outside. Vic: You never can trust those forecasts. Either of you want some popcorn? JVL: No, I can’t do carbs. JVL holds up a cardboard tray with four hotdogs without buns. Vic: That’s right, you’re on that diet. Sonny: Does being a booster mean you can validate our parking? It cost us $25 to park in the ramp. Vic: Oh, sure. I got you guys parking passes with your season tickets. Sonny: (flabbergasted and stammering) What? You…how much did that cost? And you couldn’t even park in the bleeping ramp to watch a movie for the show? Sonny lets out a string of expletives which is followed by a sullen silence. Vic senses that Sonny is not interested in conversing, so he turns to JVL. Vic: JVL, what is up? I’m glad you came. JVL: Oh, I would have done literally anything to get out of the house. Vic’s a little hurt by this. JVL notices, and softens. JVL: Oh, I’m always happy to watch gymnastics. What is your favorite event? Vic: I like all of them. JVL: I like the floor exercise. It’s the perfect display of one’s talent. No assistance of a bar, no springboard, just an athlete and her skills on display. Do you have a particular skill you enjoy? Vic: What do you mean? JVL: I mean are you more impressed by a round-off – back handspring – back layout or a round-off – back handspring – back tuck? Vic: (looking through binoculars) I don’t know what any of that means. JVL just looks at him, mouth agape. And that’s all for this week’s episode. What was Sonny up to? Was he preparing for the next Barnes and Noble Criterion sale? Was he emotionally preparing himself for the University of Virginia’s historic loss to a 16 seed? Was he tucked away in an office working on his cover story for the Weekly Standard – the cover story that was so important it didn’t even compete with a slash? Or was he just learning the art of shining shoes? You’ll have to tune in next week to find out.